The best, and cheapest, meal we had in Paris was in our little apartment. 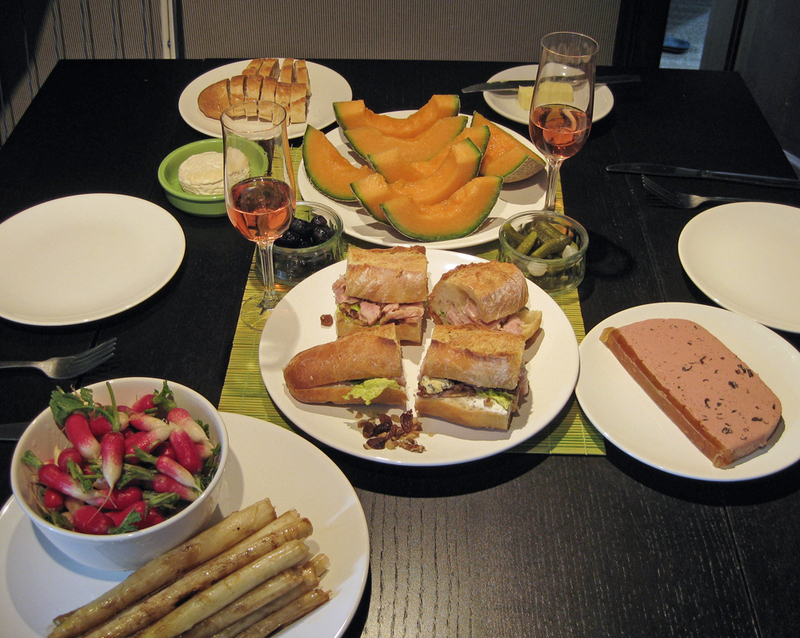 The radishes, asparagus and melon were purchased from the farmer's market; the sandwich and baguette from a local boulangere; and the pâté, cheese, olives, and cornichons from a charcuterie. The most expensive item was the Tattinger Rose Champagne. C'est la vie! Everyone has a few regrets after returning home from a vacation – regrets about what could have been done differently to make the trip more pleasant. Here’s our list of things we suggest you think about before your next big trip. A few of these things we figured out after returning home, a couple we thought of but didn’t try before we left, and a few others that we actually got right. We hope this helps you out the next time you go on vacation. Bon Voyage! Borrow guide books from the library and read them before you leave. With the average cost of a guide book being around $20, you could end up spending $60 or more on planning materials (we seem to need at least three books for any city we plan to visit). Why not borrow the books from the library? You’ll be better prepared if you read them before you get on the plane, but you can always take the books with you on your trip and if something happens to them, they get lost or damaged, you can reimburse the library for the cost. Spend the money on food and wine instead! If you prepay for tickets, hotels, airfare, etc., know what happens if an act of god threatens to prevent you from using them. To say we were lucky this time around is an understatement. Who would have known or thought that a volcano in Iceland could have ruined our vacation. We landed at Heathrow about 12 hours before the sucker blew. Even with travelers insurance we could have been out the cost of our vacation apartment rental, our tickets to a rugby match and a musical in London. Would traveler’s insurance have covered the cost and would it have been worth it? Luckily, we didn’t have to find out. Next time we go anywhere we’ll look into it, but we’ll also still cross our fingers, because, nothing’s certain, not for any of us. Rent an apartment and, if that isn’t an option, go for the no frills hotels. Seriously, why spend excessively on accommodations when you aren’t likely to spend more than a few hours each night sleeping in whatever room you’ve rented. We went budget in London with EasyHotel and have no regrets. The apartment we rented, through My Paris Visit, was worth the little extra because of the comfort and quiet it afforded us. We took advantage of it. But while it cost a bit more than a dirt cheep room in a budget inn, the cost paled in comparison to standard hotel rates. More important, we felt like Parisians, even if just for a moment. Water bottles and ground coffee. Take them with you. We hated buying plastic bottles of water, but we did so from time to time. Ultimately, we had our favorites that we happily refilled from the tap in our rented apartment in Paris (the water is fine, drink it). Better to take an empty water bottle with you that can be used throughout your trip. If you are staying in a room or apartment that supplies a drip coffee maker, take advantage of it and brew your own. We loved sipping espresso after meals but morning coffee has become such an important ritual in our lives that we missed it. Of course, Starbucks is always an option just about anywhere you go, but try ordering a “regular” drip coffee at Starbucks in Paris and see what you get! The only three phrases you need to know in any language are: Hello, Please, and Thank You. Learn them and use them often. You’ll be surprised and delighted by how well you are received. It may land you an English language menu or a change in staff to get someone to your table who can help you translate the mysteries of the day’s specials. The less you spend on food the better it tastes. Of course, we probably could have spent a fortune on a Michelin starred restaurant and eaten elegantly, but generally the meals in both Paris and London were less satisfying the more we spent. The best meals were those we prepared ourselves in our Paris apartment after shopping the local specialty stores for bread, cheese, terrine, etc. With cheap wine, a little Edith Piaf in the background and loft windows open onto our courtyard, these meals were easily the most memorable. One last note here: don’t pay for bottled water in a restaurant unless you really want to. Be clear when you order that you are only interested water from the tap. In Paris, that means asking for a carafe of water. There’s always something better to eat right around the corner. Seriously! Our first meal in London, and again our first meal in Paris, was the least appetizing of any we ate on our trip. After our meals in both places we walked around the corner only to find much more appealing looking places with better menus that we later tried and loved. Just because you’re starving doesn’t mean you should settle for mediocre food. If you’re scouting for food and you have no plan, take a walk around the corner (and then the next) before deciding on where to spend your Pounds/Euros. Even with the best laid plans, things can and will go wrong. Illness is one of those things that no one pencils into their schedule but people get sick on vacation and it can happen to any of us. It’s best to buy some sort of travel insurance before you go. Know what to do in case of an emergency in each place you intend to visit. Maybe your family doctor has connections abroad and can refer you to professionals “just in case.” Know in advance where you’re most likely to find medical assistance in a language you understand and take phone numbers and addresses with you. You don’t want to have to scramble in a medical emergency. If you’re visiting a first world destination, an emergency room visit shouldn’t present any surprises. Relax, and if you can’t relax, find the nearest pub, bar or restaurant and have a drink … or two. Do we really need to say more? Seriously, foreign travel can be stressful and there may be days when the totality of the experience – sensory overload, language frustrations, sore muscles and frazzled nerves – will leave you wanting to stand in the middle of the road screaming. Get hold of yourself and sit down. Sedate yourself with whatever the locals are drinking and take a deep breath. After all, you’re on vacation, enjoy it! If you have additional tips or take issue with any of these, we’d like to hear from you. We aren’t the world’s savviest travelers so please, by all means, share your wisdom! These are really great ideas!! I will pass them on! Wow – thanks for the great advice! We could have elaborated on every one of these tips but the plan is to expand the list over time as we write about the specifics of our food adventures abroad so please, stay tuned!